I searched high and low for comparison photos of these 4, only to come up empty. Very possibly because most normal people look for cheaper versions of the high-end colors, not other high-end versions. Umm…well…why be normal? 😉 So now that I own them all, I can give you the 411 on the differences (or lack thereof). I tried to photograph them in different lights, with flash and without, so that you could get a sense of what each one really looks like. I also put a marker on the ground so that I could take photos standing in the same place wearing each of them, so that the photos would be as identical as possible, and you could see the differences on (this was only mildly successful, sigh). The Chanel Rouge Allure formula is definitely the creamiest of the four, which I knew going into it. It does add a nice shine, though my preference in reds are a little bit more matte. 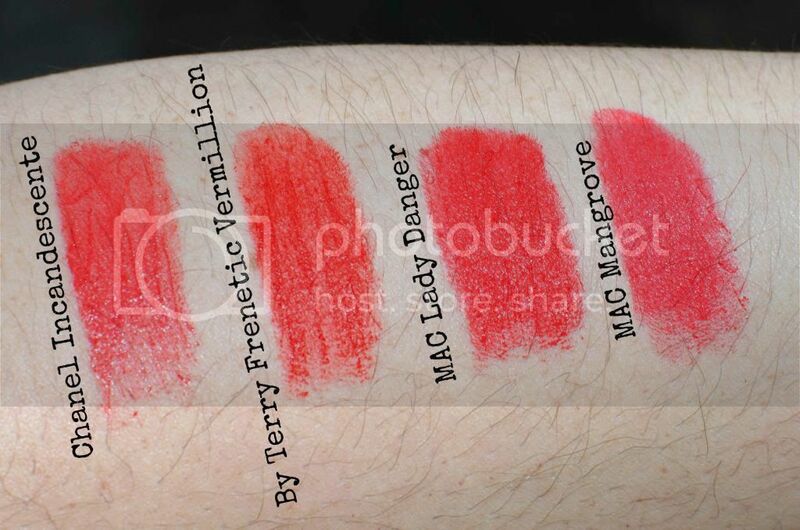 The By Terry Frenetic Vermillion surprised me by tugging a bit more going on than I was expecting. 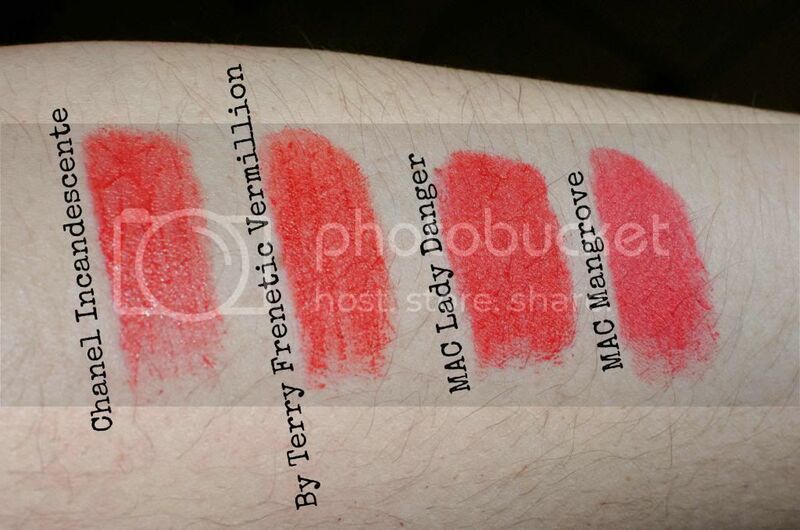 Don’t get me wrong, it’s nowhere near a MAC matte (and is not a matte formula), but the other Rouge Terryblys in my collection go on a lot creamier. 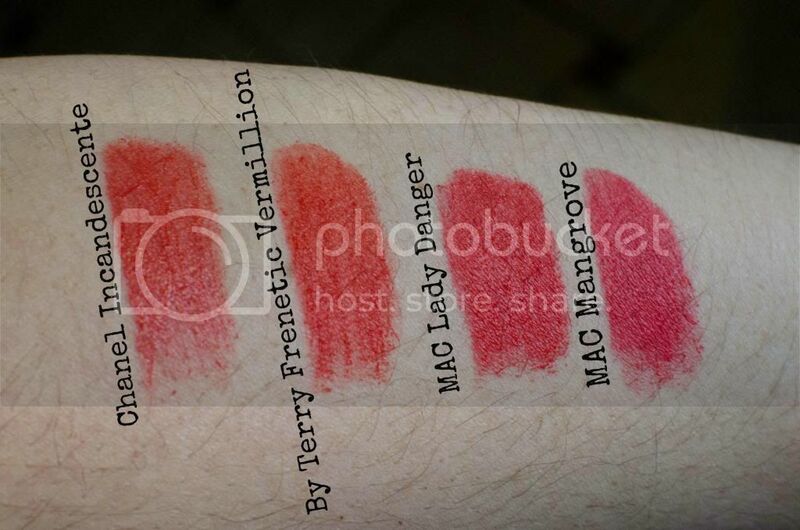 Lady Danger is definitely a MAC matte, and I always think it photographs more red than it looks in person (I feel it pulls more orange in person). The Mangrove is a bit easier to put on for a MAC matte, which was a surprise. Are these all very similar? Yes. Do you need to own all of them? Need to, no. 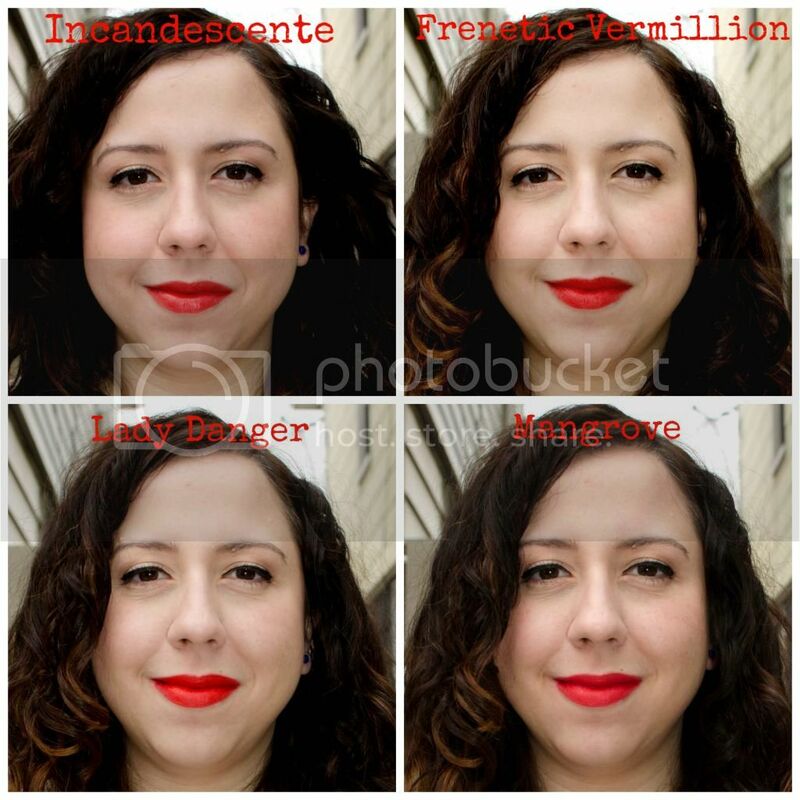 Are there differences that may make you want to? Yes. Which is the most different of the pack? 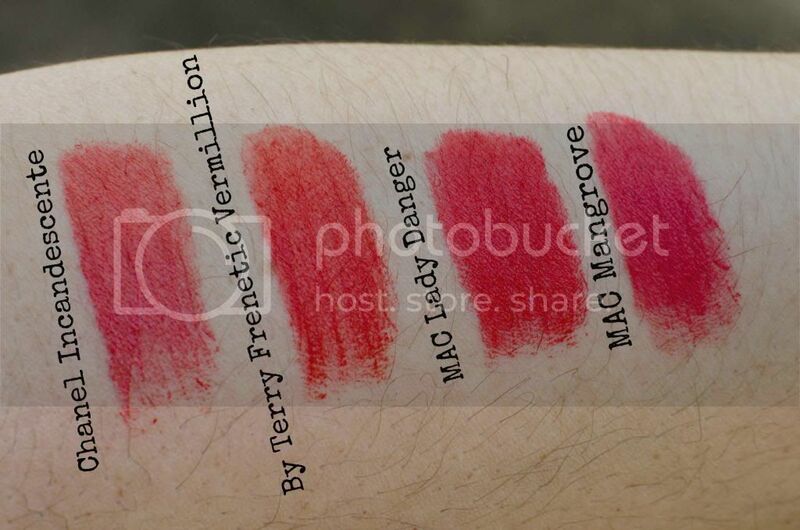 MAC Mangrove stands out as being a bit more red than the others (so you’ll feel less guilty purchasing this one in addition to one of the others 😉 ). Great idea for a new series!! Great idea! 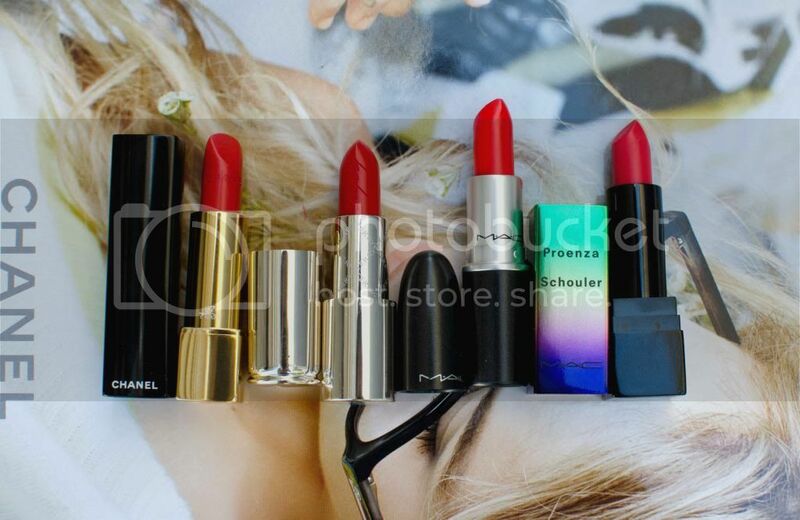 I seriously can't even fathom picking between the four colors they all look great I would really just buy them all. Well, you know that I got all of them, so I wouldn't blame you at all! I may have succumbed to yet another one…I'll have to do an update at some point, ha.